News from the Acres: Our Golden Garden Glove Affair Gala Is Tomorrow Night! Environmental justice is an ongoing struggle, and we’re here to support the communities taking it on. We just launched a new round of inventorying unused Parks Department buildings to identify more places for neighbors to create the community resources we need and desire (want to help?). We continue to collaborate via the Legacy Lead Consortium with scientists, city employees, advocates, and greening organizations to assist fellow NYers in reducing the potential harm we face from lead (get a sign with safety suggestions for your space at our store here!). 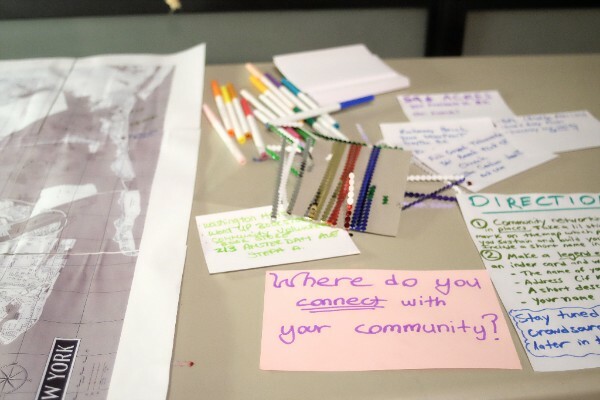 In the last two weeks, we connected and drew inspiration from Taipei’s community land access advocacy organization, and talked about transforming still-present histories of violent land use policies with Eco Practicum School for Environmental Justice in Weeksville, Brooklyn. We continue to advocate for over 300 nonprofit-owned properties to be removed from the 2017 tax lien sale, with Public Advocate Letitia James joining 17 Council Members making the call! In addition, over 12 million residential square feet of vacant lots alone have debt heading to sale in August. 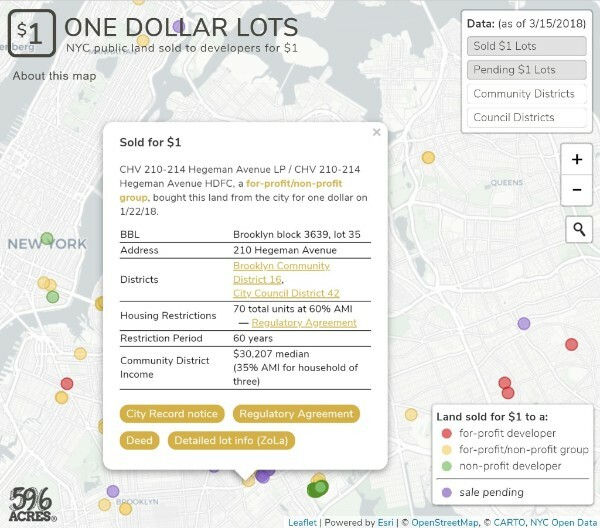 Call the Mayor at 311 and ask to have the City keep this debt as a means to make sure these lots become opportunities for truly affordable and permanently community-controlled housing, instead of going to the highest bidder! Other ways to support this advocacy here. 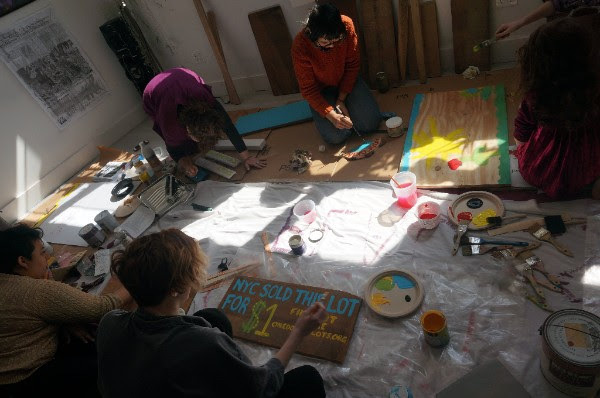 All over NYC, we are supporting residents organizing for community access to abandoned acres. Sound like work you want to be doing? We’re hiring a Director of Advocacy! 596 Acres’ Gala: A Golden Garden Glove Affair is tomorrow, Thursday, June 1 from 7pm to 10pm at Genius in Gowanus (84 4th Street between Hoyt and Bond in Brooklyn). Get ready for this memorable evening of epic live music, tasty refreshments, awesome raffle prizes, on-site haircuts, and so so much more – all in the company of some of NYC’s most incredible land stewards (like Daniel, pictured above in Isabahlia Ladies of Elegance Foundation’s Green Valley Community Farm of Brownsville; photo by Murray Cox)! Get your tickets here to support space for community resilience in NYC. Greenpoint, Brooklyn – Join Java Street Community Garden next Saturday, June 10 from 2pm to 6pm for their annual Spring into Summer Party! 59 Java St between Franklin and West. Flier here. Free and open to all! Facebook event page here. Edgemere, Queens – Join Edgemere Farm at Beach 45th Street and Beach Channel Drive on Wednesday mornings at 9am for all level, by donation yoga with Mi Gente Yoga. More information here. Lower East Side, Manhattan – With help from NYC Parks GreenThumb, Siempre Verde at Stanton and Attorney Streets is getting a new access ramp to achieve better accessibility for people using walkers, strollers, canes, wheelchairs. See photos here. Learn about Capturing Carbon in Urban Soil: What’s Possible in Cities this Friday, June 2 from 8:30am to 10:30am at 77 Water Street (East River Meeting Room, 4th Floor) in Manhattan’s financial district. Long lauded for its benefits in agriculture, the carbon sequestration potential of soil is now being studied and pioneered in urban settings throughout the world, including New York. 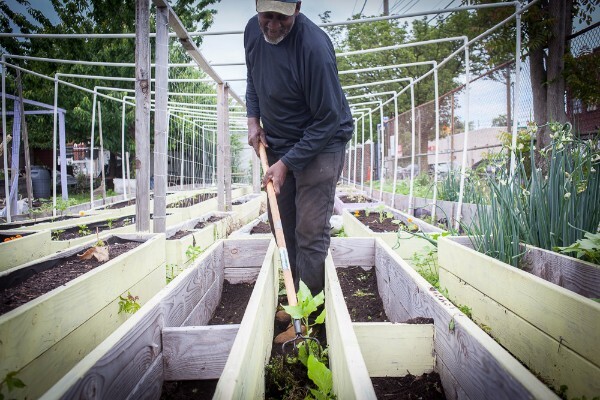 Join Urban Green to hear about some of the key soil sequestration concepts used by local practitioners (like community growers!) to increase urban soil carbon while reducing pollution and waste. Event information here. Do you have questions about creating landmarks and historic districts, working with the Landmarks Commission and Department of Buildings, or common zoning and land use issues? Check out the Historic Districts Council‘s free monthly land use clinics. Next Thursday, June 8 from 5pm to 6pm (and the second Thursday of each month! ), it’s at Councilmember Ben Kallos’ office at 244 East 93rd Street at Second Ave in Manhattan; call (212) 860-1950 to reserve your spot. On the following Thursday, June 15 from 3pm to 4pm (and the third Thursday of every month! ), it’s at Council Member Vincent J. Gentile’s office at 8018 5th Ave between 80th and 81str Streets in Brooklyn; call (718) 748-5200 to reserve your spot. 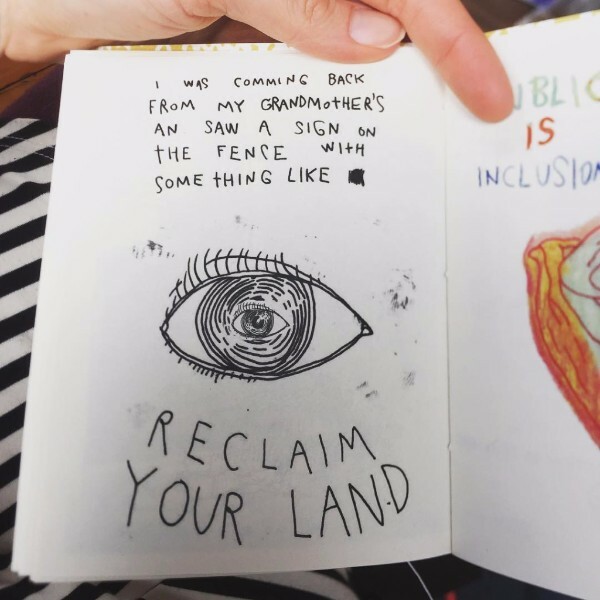 Shatia tells the story of encountering a 596 Acres sign on the abandoned city-owned lot that would become 462 Halsey Community Farm (near Lewis) in Bedstuy, Brooklyn in I’m So Lucky You Found Me: public land inside the city. This handmade book by 596 Acres and collaborator Daniel Eizirik is full of those stories. Get it at the 596 Acres Store.